These heritage piglets can till and fertilize the soil. 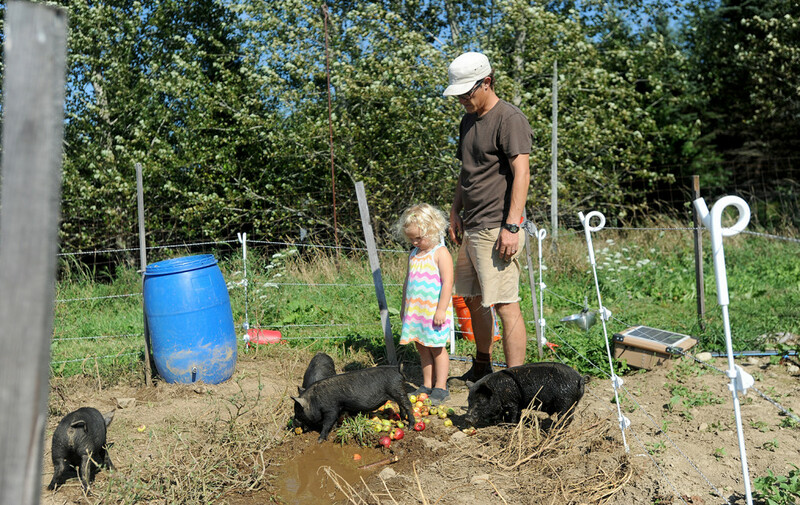 Daniel MacPhee and his daughter Annah, 3, stand with their recently purchased guinea hog piglets at Blackbird Rise Farm in Palermo. The family purchased the hogs to help turn the land. 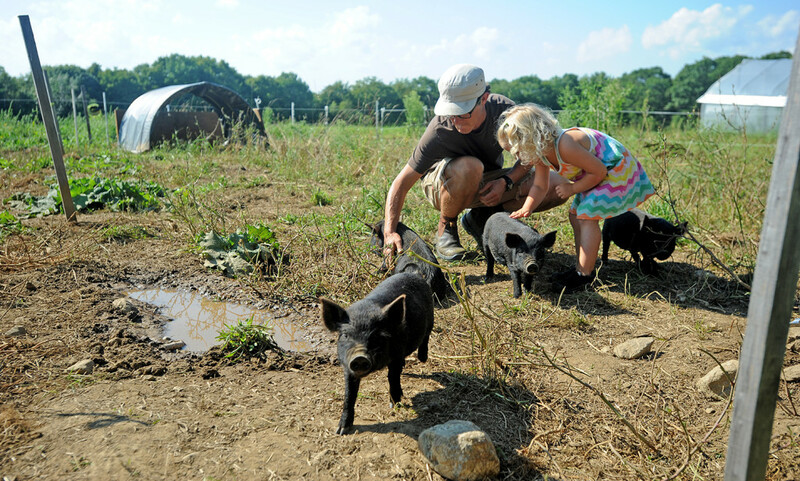 PALERMO — In an unusual effort to reclaim an abandoned raspberry patch and other farmland, Daniel MacPhee and his wife, Corinne Wesh, recently purchased four American guinea hog piglets, a breed of heritage pigs known for their foraging ability. The pigs are also prized for the fatty quality of their meat, but the couple and their two children don’t intend to eat them – the family is vegetarian. Instead, the piglets are meant as an environmentally- and budget-friendly clean-up crew of sorts, rooting around to clean out tough, tangled roots after a small flock of sheep has grazed at the couple’s farm, Blackbird Rise in Palermo. The animals, which came from a student-run farm at nearby Unity College earlier this summer, spent a recent afternoon tilling a section of field where the family had planted and harvested heritage grains, including wheat and emmer. It takes the four piglets, who were born in June and now weigh some 18 pounds each, about one week to turn over a patch of ground measuring 25 feet by 25 feet. 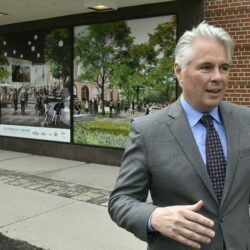 They’ll get quicker as they mature, MacPhee said. Using the hogs to till the soil is also a way to preserve the population of these rare pigs. In the early 2000s, American guinea hogs were thought to be extinct. Then 26 were discovered on a small farm in Georgia and carefully nurtured and bred. Now, their numbers are estimated at between 1,000 and 3,000 hogs. Their small size and the tidy manner in which they eat roots and stumps without leaving behind big holes is also making them increasingly popular, Farnsworth added. An adult female American guinea hog weighs 150 to 175 pounds, the males 250 to 300 pounds; other types of pigs, depending on the breed, weigh between 500 and 1,200 pounds. Although the pigs were rediscovered in Georgia, the breed actually originated in England, Farnsworth said, and they adapt easily to colder climates such as Maine and even Alaska. MacPhee and Wesh are among a growing number of guinea hog farmers. The pair bought Blackbird Rise about two years ago when they moved to Maine from Connecticut. 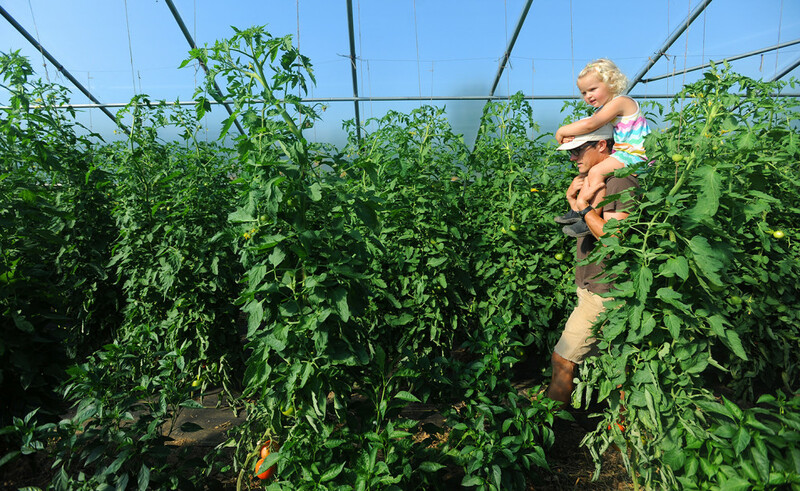 They sell grafted fruit trees and organic seeds, including tomatoes, sunflowers, red peppers and herbs like echinacea and stinging nettles, primarily to Fedco Seeds. 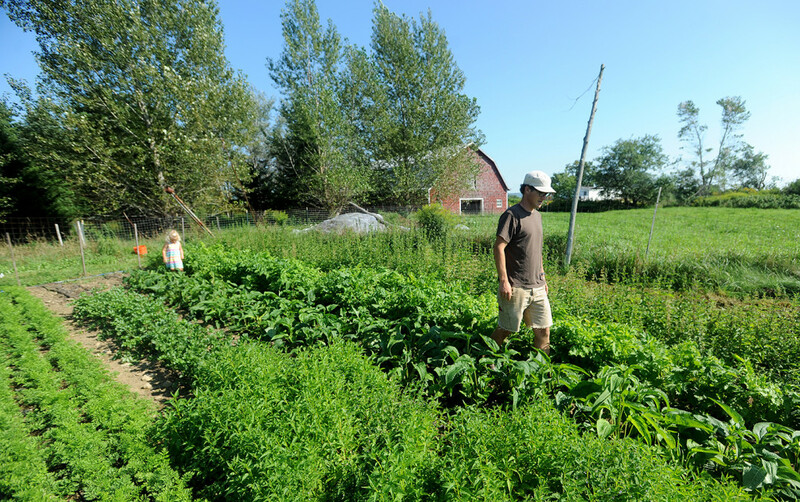 Both are recent graduates of the Maine Organic Farmers and Gardeners Association’s journeyperson program. The family first bought sheep – taking their time to pick out five that suited the farm: Picnic, a Romney-Island cross; Moon and Twig, two Border Leicester-Romney-Finn crosses; and Happy Thursday and Myrna Donald, Border Leicester-Romney-Corriedale crosses. Then came the guinea hogs. They also have ducks. 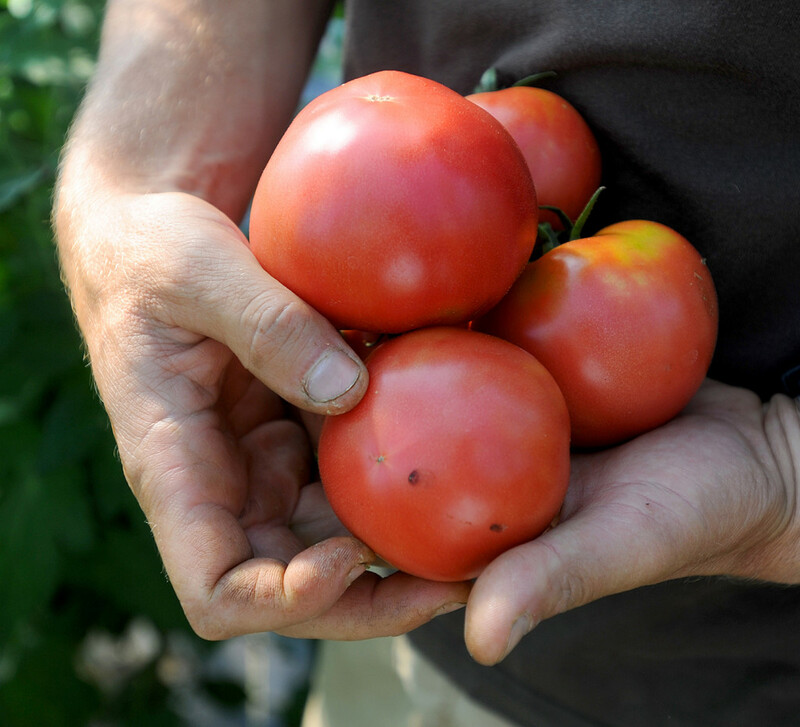 “Generally, animal agriculture is good for the soil and good for the farm,” said Mark Hews, executive director of the Maine Sustainable Agriculture Society, an organization that assists farmers in implementing sustainable practices. Using animals to farm is one method of carbon sequestration, Hews explained. Healthier soil can act as a “sink” for the greenhouse gas. MacPhee said he has never been good with machinery, plus the hogs cost less than buying farm equipment, such as a new tractor and tillage attachments, or hiring someone to till the soil. They decided to discontinue the labor-intensive u-pick berry operation and use the space for nursery production. “We figured we could either buy more equipment or spend some of that money on the piglets,” said MacPhee. The piglets, $150 apiece – no contest. Since these pigs aren’t being raised for meat and needn’t fatten up quickly, they survive on what they forage, plus farm scraps. So far, only the smallest pig has a name – Dorothy, after a family friend in Connecticut. 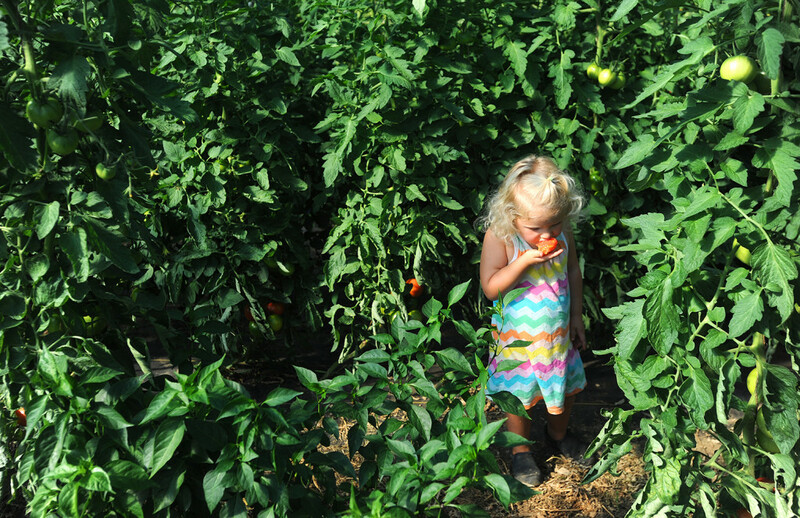 On a recent afternoon, the couple’s daughter, 3-year-old Annah (who snacks on a tomato the way many children do candy) fearlessly jumps into the pen with Dorothy and her siblings, scratching the pigs’ bellies and feeding them apples from a barrel.